We looked at the top 1 Ping Pong Tables and dug through the reviews from 6 of the most popular review sites including BestReviews, Table Tennis Earth, Pong Boss, Equipment Junkie, Ping Pong Perfect, Game Tables Guide and more. Through this analysis, we've determined the best Ping Pong Table you should buy. A lightweight design makes the JOOLA Inside Ping Pong Table ideal for players who want portability. With a four-wheel trolley and fold-up design, you can easily tuck this table away when not in use. It's also lightweight and affordable, making it a good fit for many households. In our analysis of 41 expert reviews, the JOOLA JOOLA Inside Ping Pong Table placed 5th when we looked at the top 9 products in the category. For the full ranking, see below. Checkout JOOLA Inside Ping Pong Table for a detailed review of all the top ping pong tables. The ball will bounce evenly on any part of the table and it is grippy enough to react to whatever spin the ball may have. The Joola Inside Table Tennis Table is definitely on the lighter side of tables, weighing in at a mere 137 pounds. This provides easy mobility for the table. The folding mechanism is well thought out and appears to be very durable. The locking mechanisms for the up and down positions also ensure that the table can be safely used around players of all ages and abilities. The Table comes almost pre-assembled so you won’t need more than 30 minutes to put it to use. A few reports of missing pieces and flaws in the paint. Top may be prone to scuffing after typical play. Exposing the table to high heat or humidity will result in the table warping, which will basically ruining it. The weakness we saw with this table is the thickness of its playing surface. 15mm is really on the thinner side of tables and as such you can expect the ball to play slower and the bounce to lack height as compared to play on a thicker table. 15 mm thick table top may not be thick enough for more advanced players. Danger of table wrapping when this table is stored in a high heat or high humidity area. The JOOLA Inside 15 Table Tennis Table with Net Set has been JOOLA's best-selling table year after year! 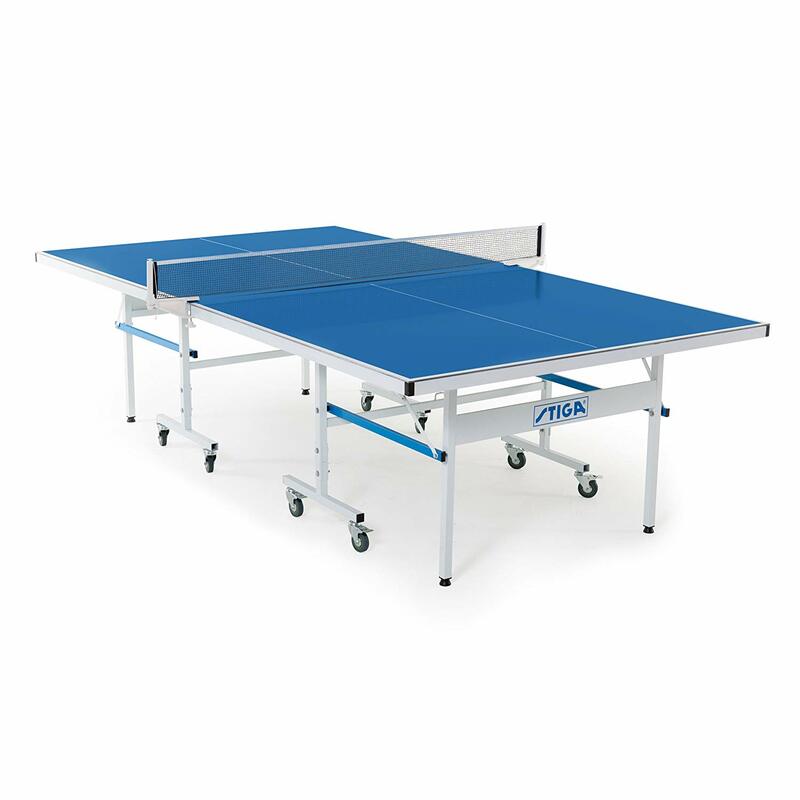 This is the perfect table for anyone looking for a fun-filled game of table tennis at an affordable price. This awesome table tennis table comes 95% pre-assembled and is ready to play in just 10 minutes! A sleek frame and separable nesting halves make this table perfect for compact storage. The professional-grade 5/8 inch (15 mm) wood composite surface creates a consistent ball bounce and durability. Additionally, the 1.5 inch apron and 1.5 inch diameter sturdy steel legs are used to create a durable table that lasts for years. The table legs feature adjustable height levelers to ensure a level playing surface and 3-inch locking caster wheels for added stability. The JOOLA Inside 15 Table features dual safety anti-tilting locking devices to ensure safety when the table is in both playing and storage positions. The included net and post set features a simple, removable clamp post and an adjustable net tension system. The JOOLA Inside 15 Table Tennis Table and Net Set are USATT approved. Start playing like a champion with equipment developed for champions! JOOLA is a proud sponsor of USA Table Tennis. Disclaimer: This is not a Ping Pong branded product and is not covered under any Ping Pong manufacturer’s warranty. The Ping Pong brand names and logos are the registered trademarks of Escalade Sports.